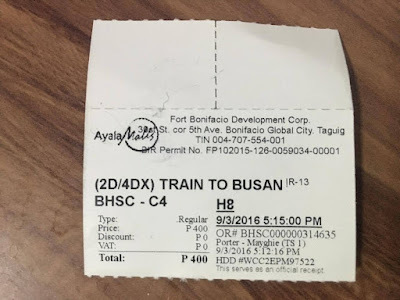 Much love and thanks to a movie group from a popular Philippine forum, I was able to try a 4DX theater through the Bonifacio High Street Cinema in Taguig City. Well, this was a few months back but I can still recall how it felt. 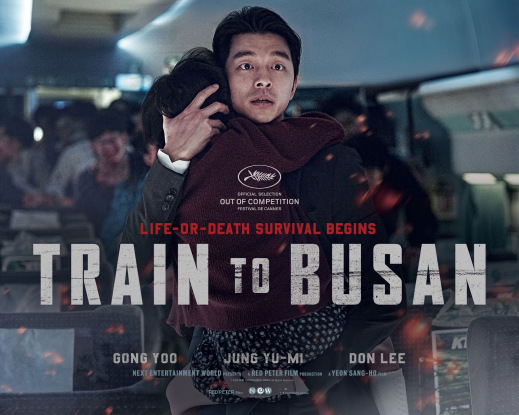 The movie was the South Korean zombie apocalypse which revolves around the literal train trip to Busan. 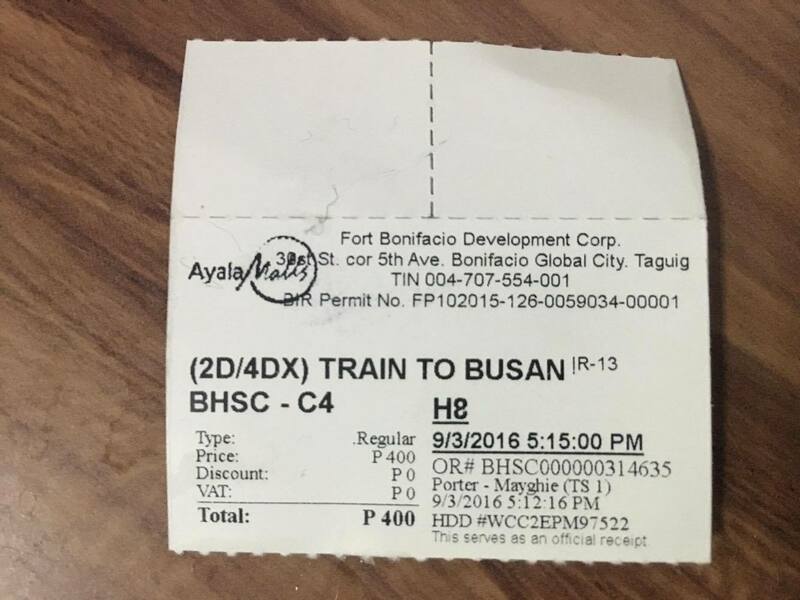 Let me link you to the li'l feature I posted about Train to Busan elsewhere here. 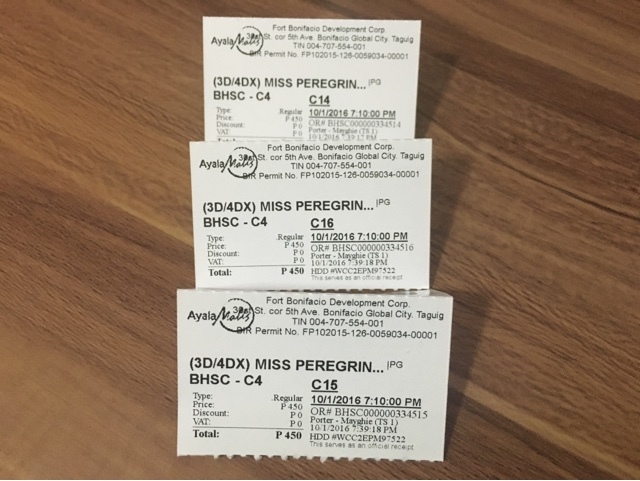 I was back at the same theater during the release of Miss Peregrine's Home for Peculiar Children. I brought my family with me so they can try the experience too. There's not much introduction needed for 2D. It's the traditional cinematic format which had been used for a while now. 3D incorporates three-dimensional viewing, hence the name; made available through the use of 3D-compatible glasses. Imax can show both 2D and 3D in large screen format. Now on to 4Dx, it can also be in 2D and 3D, like Imax. What makes it different is the added special effects which affects all senses. Other than seeing and hearing how the film progresses, you'd also feel movements and smell something. During Train to Busan, there's a pungent scent which can imitates how zombies smell. Well, we don't really know for sure since no one has literally seen a live zombie. :) But it sure was nasty! The seats were moving too. It can be slow to mimic a walking character or fast enough to feel as if you're running too. In Miss Peregrine, there were even bubbles during that scene underneath the ocean and other parts when water was involved. My daughter (along with other kids who were also present), surely loved it and even tried to reach for the bubbles. I love how there are numerous food places within the cinema area's floor so food choices are not limited to the usual type of movie snacks. Yes, you can bring any type of food purchased within the floor, inside the theater. I had an issue with ticket purchase online though. While the process for reserving and buying tickets online is simple (including the registration), cancellation is a problem. It needs to be performed an hour before the show. That's bad news if you get stuck in traffic all of a sudden while on the way, which is what happened to us. Refund for online ticket purchase is also not allowed. I'm sure the bank (credit card provider) will not refund it as well. So while we were late for a good 30 minutes, we decided to watch anyway. It was a time viewing. 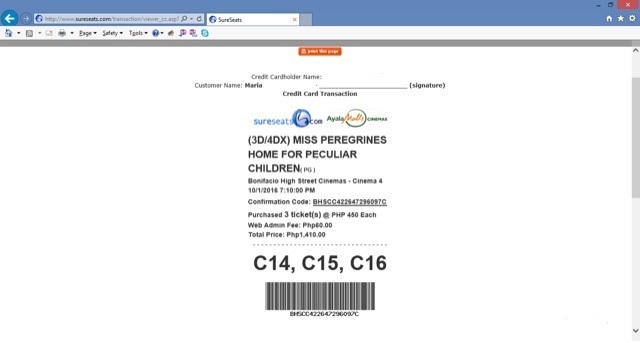 On the bright side, we need not claim the ticket at the counter and just needed to show the email confirmation right at the designated cinema for the bar code. Another issue is with browsers. I accessed tickets through Internet Explorer. It doesn't display properly on Chrome. For more questions or issues and possible solutions, see this FAQ page from SureSeats. Why do people take seats that are not theirs? Just a side story, there were people who were seated at our designated seats when we arrive. Well, they probably thought it was empty since we were late. Good thing a cinema attendant assisted us and politely requested those people to move. This wasn't the first time either. It also happened during a PBA game.